Jaguar Land Rover changes pay day | What Car? Jaguar Land Rover has asked its staff to accept a delay in the payment of their wages. The car maker has proposed that salary payments are moved from the current payday on the 15th of the month to the end of the month in order to ease cashflow issues. It has been reported that workers who agree to the change will receive a one-off 200 payment. The report in Works Management, a manufacturing business publication, said that Jaguar had negotiated extended payment terms with its suppliers from 45-day to 60-day terms. The extension means that supplier payment dates clash with those of staff, which has prompted the change in wage payments. 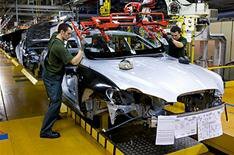 Jaguar Land Rover employs 14,500 staff and made 450 redundancies earlier in the year.